Songwriting can be a lonely sport. Anyone who’s been at it for any length of time will tell you that, unless they cowrite exclusively, the pursuit of fresh ideas, the many hours honing memorable lyrics and killer melodies can be quite challenging and sometimes the inspiration to do it can fade, leaving the writer discouraged and sometimes even giving up on it altogether. One mental tweak that could jumpstart your songwriting again, and possibly even save it altogether, is to learn how to inspire yourself. We grow up looking for the leadership of others to keep us going – our parents, boss, or spouse – but real songwriters know they must inspire themselves each day to stay at it and keep writing, no matter what. NCS Boot Camp alum Trevor Graves knows this all too well. A very talented young writer, Trevor is working hard to write at the highest possible level and to keep himself inspired towards that goal. He’s learned that talent alone won’t make him successful, but an unflinching tenacity and extraordinary determination are key to surviving the ups and downs of artistic endeavors. Find fresh inspiration in Trevor’s episode on The Song Revolution Podcast and never give up! Are you ready to take your songwriting to the highest possible level? Are you ready to fill in the knowledge gaps that have kept you from writing the songs you know you’re capable of? The next NCS Boot Camp begins January 8th. 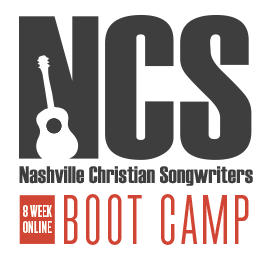 If you’re ready to take bold action to fulfill this burning desire to write your most compelling songs yet, read more HERE to see if NCS Boot Camp is your next right step!